RedDoorz Plus @ Jalan Raden Intan Lampung is conveniently located in the popular City Center area. The property offers a wide range of amenities and perks to ensure you have a great time. 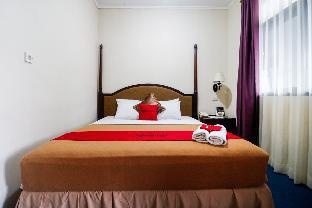 Free Wi-Fi in all rooms, 24-hour security, 24-hour front desk, car park are there for guest's enjoyment. Guestrooms are designed to provide an optimal level of comfort with welcoming decor and some offering convenient amenities like towels, closet, internet access – wireless (complimentary), air conditioning, desk. The property offers various recreational opportunities. For reliable service and professional staff, RedDoorz Plus @ Jalan Raden Intan Lampung caters to your needs.